Holy macaroni! Can I just say how amazed I feel at the response to yesterday’s post? I was so nervous when I hit publish and was really afraid to put that out there. But guys! From the bottom of my heart, thank you SO much for your words of encouragement. The burden feels just a little bit lighter after getting that off my chest. I may have had conversations in the car with myself while reading some of your responses. I wasn’t kidding when I said that I wanted to get back to sharing more. 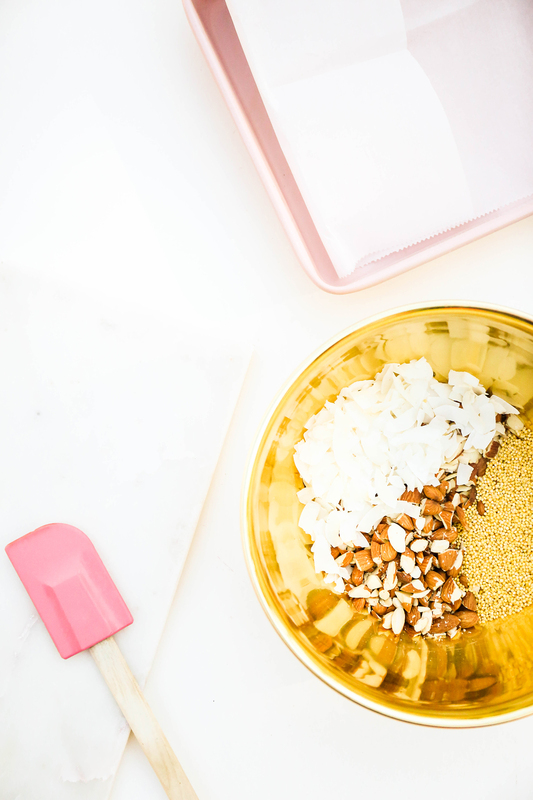 And today I want to share this KIND bar hack! 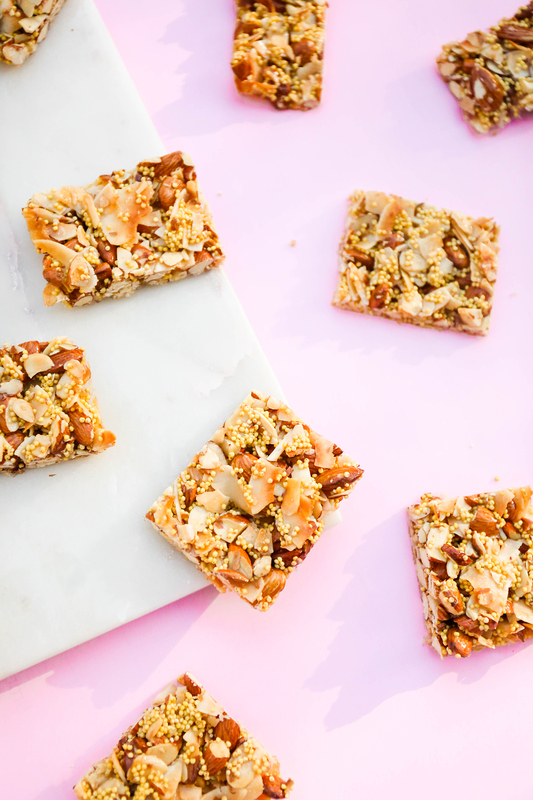 I have been hooked on the almond coconut KIND bars for years. They’re the tastiest bars ever and I love them. But I don’t love dropping some serious cash every time I want to buy a box. I’ve been eating enough of these bars that I figured I could come up with something that was pretty darn similar for a fraction of the cost. And that’s precisely what I’m sharing with y’all today! Can I get some high fives? The ingredient list is an easy one! 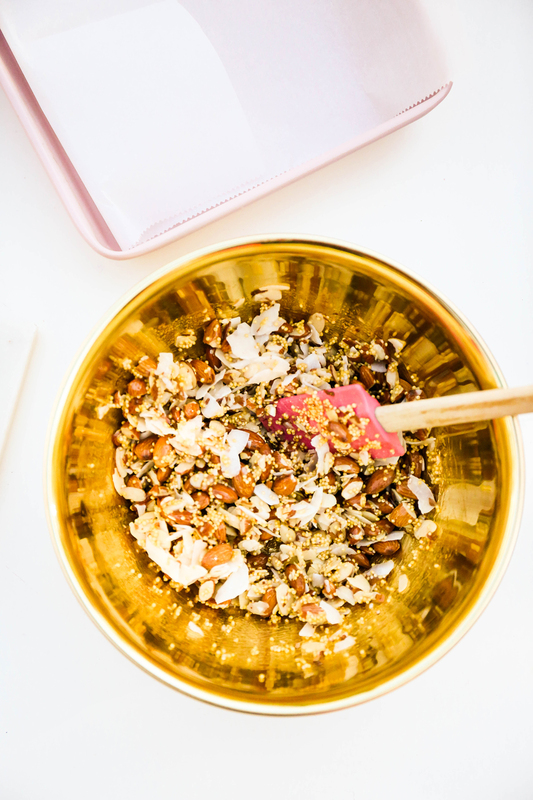 Grab almonds in all forms! Whole. Chopped. Slivered. And then add some unsweetened shredded coconut and a lil’ millet. Organize it on a slab of marble and call it art. Just kidding. Just combine all that dry stuff in a large bowl. And then pour over the corn syrup or brown rice syrup. 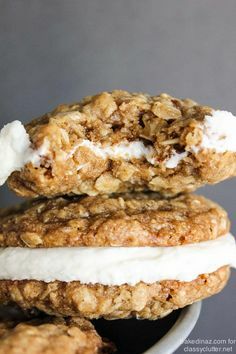 **I used the brown rice syrup to add some natural sweetness. If you DO go with the corn syrup, add a splash of almond extract to add some flavor! 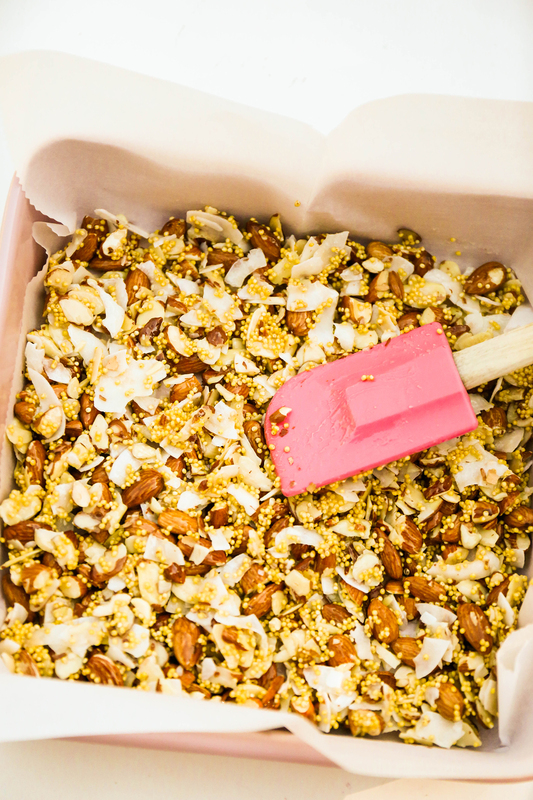 Spread the mixture in a parchment-lined baking pan and bake for about 15 minutes. 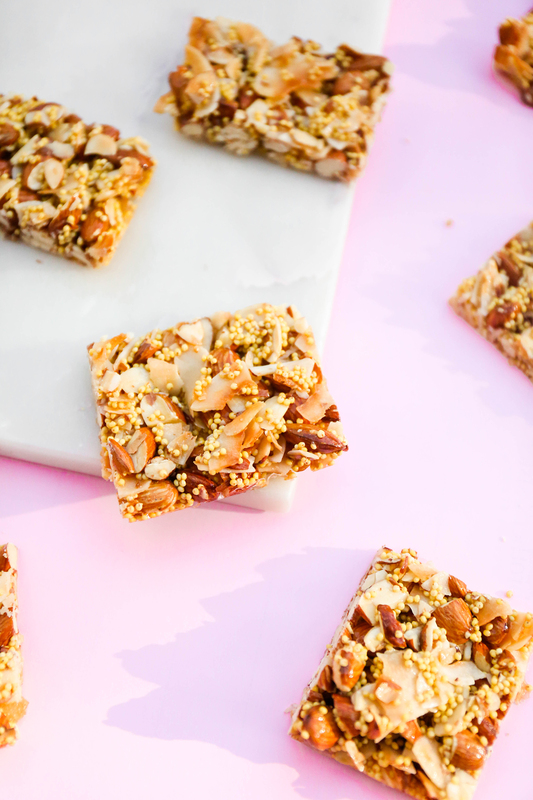 Remove and allow to cool for a few minutes before cutting into bars! These little squares disappeared so fast. SO FAST. And I’d blame it on Vita, but it was totally me. 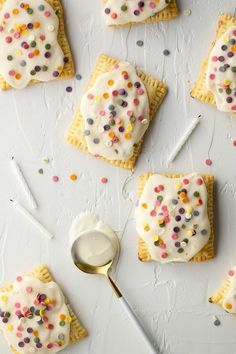 Make these today. Or this weekend. 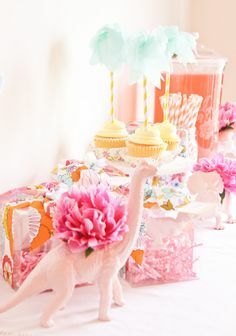 And then rejoice in the fact that you can have your cake and eat it too. Er, have your KIND bar and save some dough! 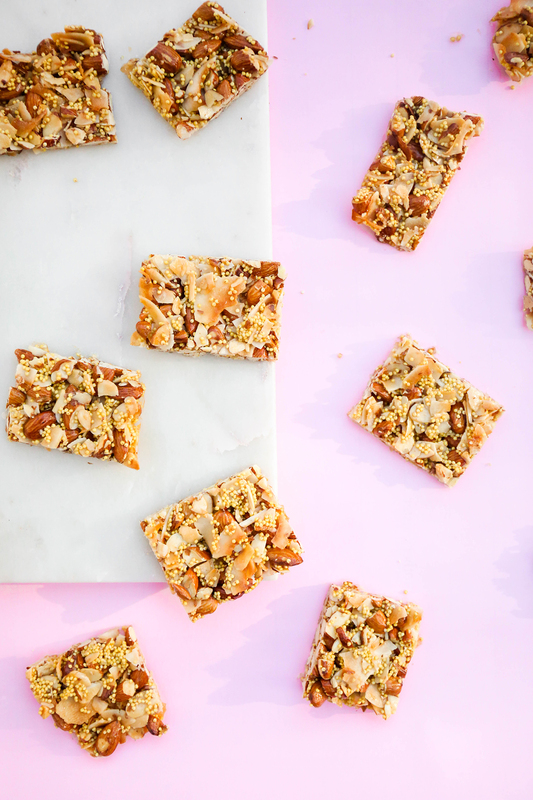 Combine all sorts of nuts and fruits to have a kind bar hack for every day of the week! 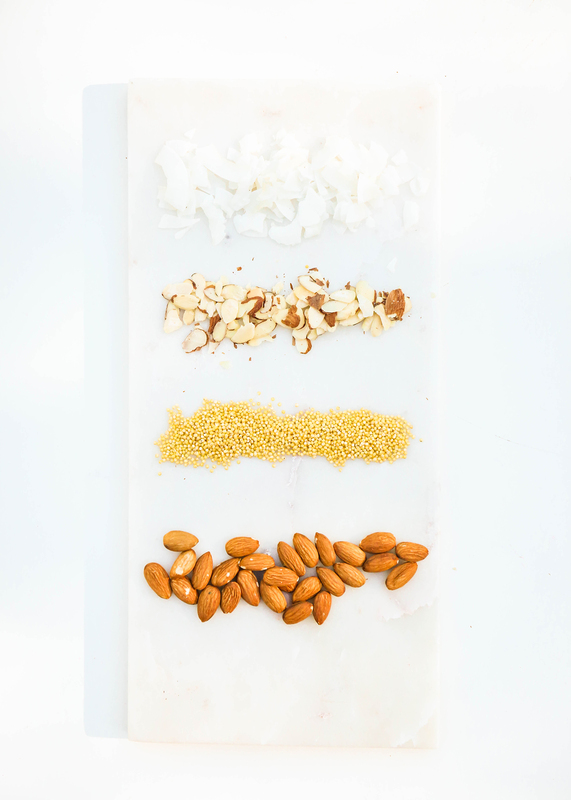 Create your own homemade almond coconut KIND bars with 5 simple ingredients! Preheat oven to 375 degrees Fahrenheit. Line an 8×8 baking pan with parchment paper. 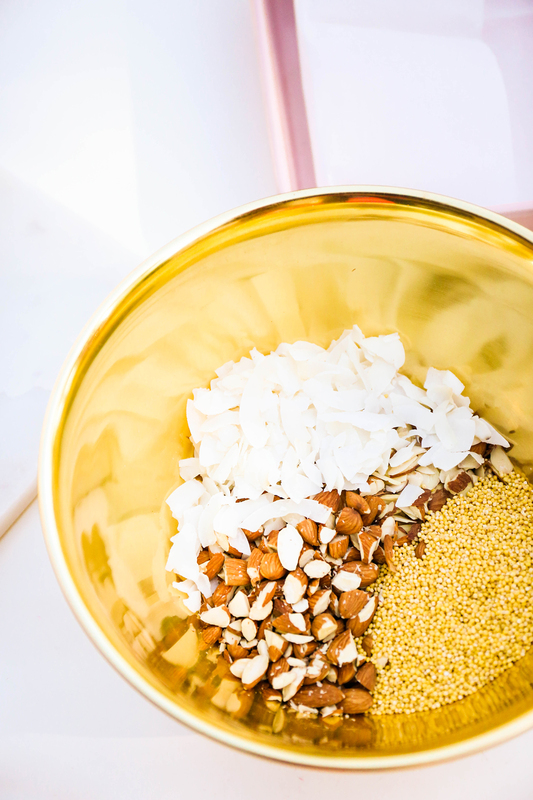 In a large bowl, combine almonds, coconut, and millet. Add the almond extract to the syrup and mix well. Pour the syrup over all the dry ingredients and stir until everything is coated. 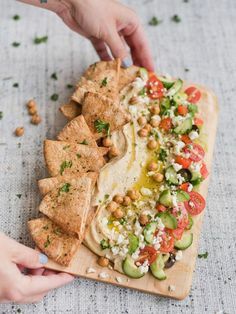 Pour into the baking pan and spread evenly. Bake for 15 minutes or until the edges are turning a light golden brown. Remove from the oven and allow to cool for 10 minutes. 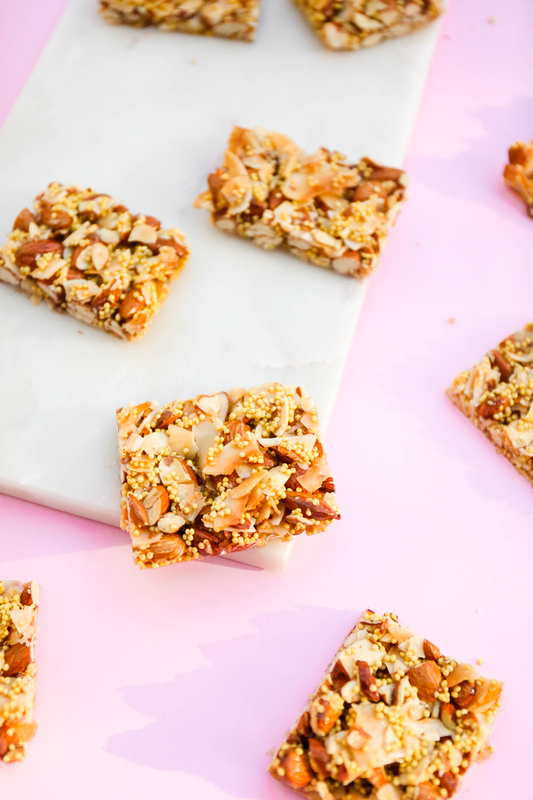 Slice into small bars and enjoy! To store: Wrap bars in plastic wrap and then place in a ziplock bag and keep in refrigerator for up to 1 week, or in the freezer for 3 weeks. I love kind bars. Had a bunch of them at bolder boulder and so yummy!